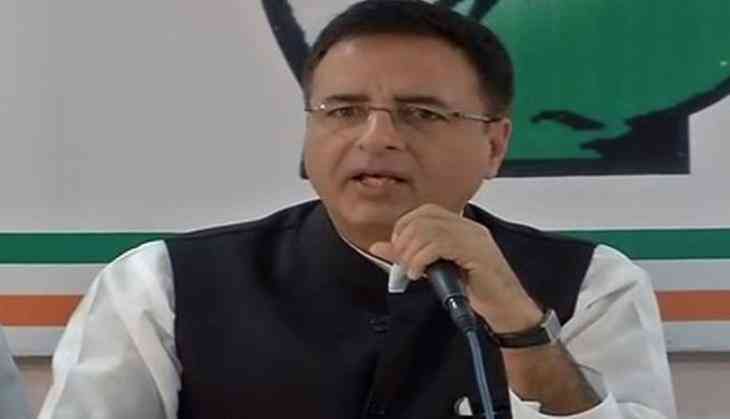 Congress spokesperson Randeep Singh Surjewala said that Prime Minister Narendra Modi has blatantly politicised the bravery and martyrdom of India's soldiers with an eye on 2019 Lok Sabha elections. "Having failed on every front, Narendra Modi is indulging in shameless credit-seeking for the valor of Armed Forces as a last resort for the 2019 elections. He has blatantly politicised the bravery and martyrdom of India's soldiers as a political pamphlet," said Surjewala. "The nation today witnessed a monologue by a narcissistic Prime Minister sans any sense of accountability. Prime Minister is obsessed with one word - 'Modi'. He forgets that India is a thriving democracy of 132 crore people with a multitude of opinions and not an oligarchy of BJP-RSS loaded by Narendra Modi," he said. "Compromising national security and gross intelligence failure are the characteristic style of a non-functioning Modi Government. When will Modi take decisive action against Pak-sponsored terror?" Surjewala asked. He also said that in the last 56 months, 498 soldiers and officers have been martyred in Jammu and Kashmir and 55 brave soldiers laid down their lives last month owing to the menace of Pakistan-sponsored terrorism. He said, "Prime Minister speaks about accountability forgets that instead of bringing back Rs 80 lakh crore of black money within 100 days, as promised by him in 2014, the likes of Vijay Mallya, Nirav Modi, Mehul Choksi and many others have run away with nearly Rs 1 lakh crore of public money under his watch. Not only this, Nirav Modi was last seen getting himself photographed with PM Modi in the World Economic Forum in Switzerland." Meanwhile, Prime Minister Modi, speaking at the India Today Conclave here on Saturday, said: "Today, the entire nation has felt the absence of Rafale. Had we got Rafale, the result today could have been different. Initially, people were doing 'Swaarthneeti' on it. Today they are doing politics on the same. The country has suffered a lot because of this." The Prime Minister also alleged that the opposition is questioning India's security forces at a time when the entire world is with us. "When the entire country is with our forces, there are people who are questioning forces. The world is united to fight against terrorism, and at that crucial time people are questioning the forces," he said. Sharpening his attack on the opposition, Prime Minister said: "People in their quest to be anti-Modi have become anti-India." "I want to ask these people do you trust our forces or do you trust those who carry out attacks on our soil. Many Modis will come and go but India is going to be here forever," he said. He added: "If you want to oppose Modi, you are free to do so. But do not oppose what is in favour of the nation. They should be careful that in this stubbornness of being anti-Modi, they may end up giving support to terrorists like Hafiz Saeed and others." Hitting out at the opposition further, the Prime Minister claimed that the security forces had asked for 1.86 lakh bullet-proof jackets but till the time his government came to power, not one jacket had been purchased. "I would like to inform you that in 2009 the forces had asked for 1.83 lakh bullet-proof jackets but not one jacket was bought till the time we came to power. This is shameful. In our tenure, we have got 2.30 lakh bulletproof jackets," he said. Accusing the opposition of being corrupt, Prime Minister Modi said: "There many so many defence scams, which took place during their era. They began with Jeeps and later graduated to weapons, submarines, and so on. In the process, the defence sector suffered immensely. Ishqbaaaz: After Nakuul Mehta's show, now these popular Star Plus shows to go off-AIR; what's happening? READ NEXT >> Ishqbaaaz: After Nakuul Mehta's show, now these popular Star Plus shows to go off-AIR; what's happening?